Shillong, Oct 17 (IANS): He has been a fan of legendary musician Carlos Santana since he was 10 years old and now at 50, guitarist Rudy Wallang gets a chance to open a show to welcome the iconic Mexican-American guitarist at the Formula One Rocks concert in Greater Noida, adjacent to national capital New Delhi, later this month. The feeling is ecstatic, he says. Wallang, guitarist with the Shillong-based blues rock band Soulmate, will open the show for Santana along with his bandmates on Oct 28. "It was a dream....and it has come true for me and Tips (Tipriti Kharbangar, the lead vocalist) as well," Soulmate lead guitarist Rudy Wallang told IANS. 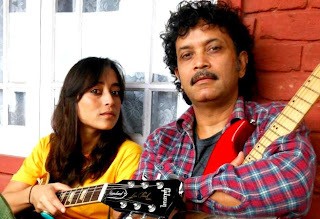 "I first heard 'Black Magic Woman' when I was about 10 years old and the first notes of that song are still stuck in my soul," the Shillong-born musician said and added that he doesn't know whether Santana will jam with him on stage. Wallang is one of the foremost singer-songwriter-blues guitar player in the country with a long musical history. He has been part of well-known blues rock acts - Great Society & Mojo. "It is an honour for us to open the act for global music icon Carlos Santana. Our music derives inspiration from his legendary compositions. It is like a dream come true for us. We are looking forward to this special moment," said Wallang with a smile. "I have also composed a song called 'Moon Magic' back in 1983-84, which was my tribute to Santana and we will be playing it at the concert," Wallang revealed. Santana, 65, has sold more than 100 million records and has won 10 Grammy Awards. Tipriti, fondly called Tips, said: "I am lost for words now. I have seen him only on television. I am looking forward to playing and talking with Carlos Santana. I am sure it will be a magical moment for me and our band." The 29-year-old has earned a name as one of the finest female singers to have emerged out of Shillong and India as a whole. Tips, however, admitted that she started feeling for Santana's music when she heard his version of "While My Guitar Gently Weeps". "These tunes are capturing the imagination of our generation. His music is full of thoughts, meaning and feelings," she said. "We are all geared up to create history in music by performing as the opening act for Santana," she added. The musicians backing Soulmate are Leon Wallang(Bass), Shaun Nonghulo (Drums)and Raveen Pandey (Hammond Organ). The band has given as many as 500 performances in the country and abroad, including in countries like the US, France, Germany, Sweden, Singapore, Indonesia Bhutan and Nepal. Soulmate has recorded two albums thus far - "Shillong" and "Moving On" - and is in the process of putting down songs for the next one. "Carlos Santana's music spans over four decades. Being a multi-Grammy Award winner, he is a perfect fit to headline this year's F1 Rocks, as also to bring mainstream music in the popular genre of Rock music to a wider fan base in India," said T. Venkat Vardhan, MD of event management company DNA Networks.